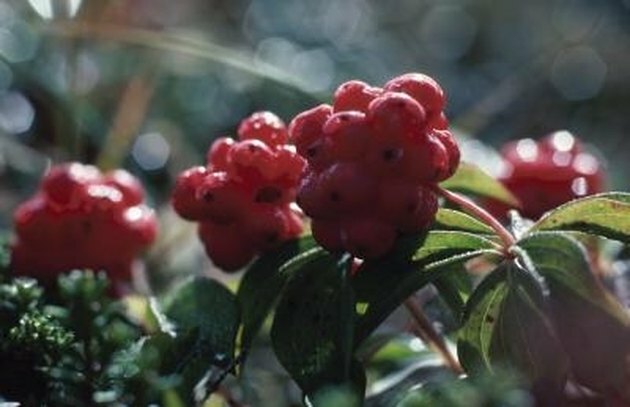 Several varieties of trees grow red berries, but most produce their fruits in the fall or winter rather than the summer. Trees that produce red berries in the summer often attract wildlife and provide nesting habitat, shelter and food for beneficial bird species. When choosing summer-fruiting trees, consider species' cultural needs, such as soil types, sunlight exposures, moisture requirements and cold-hardiness ratings as defined by the U.S. Department of Agriculture's Plant Hardiness Zone Map. Red berries add color to the garden. Native trees are indigenous to North America. The madrone (Arbutus menziesii) produces an abundance of small, red to orange berries in spring and summer. This evergreen is hardy in USDA Plant Hardiness Zones 7 to 9 and thrives in full sun to full shade, moist to dry soil, and clay or loam. Madrones grow to 65 feet tall and have rounded or umbrella-shaped canopies. Summer holly (Comarostaphylis diversifolia) produces tiny red berries in spring and summer, following showy, white spring flowers. This evergreen grows to 20 feet tall in a compact, rounded shade. It prefers full sun to partial shade and moist, acidic to alkaline soil. Summer hollies are hardy in Zones 9 to 10. Native trees offer many advantages, as they are inherently adapted to their home region's climate, pests, diseases and cultural conditions. The serviceberry (Amelanchier laevis) produces deep red, bird-attracting berries in summer. This deciduous, North American native tree grows to 25 feet tall with a similar spread. 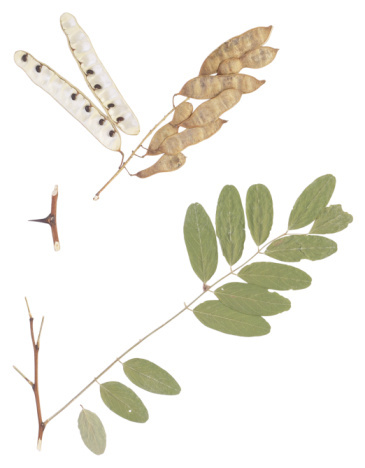 Its foliage changes from brown-purple to green as it ages, then turns yellow to red in autumn. Serviceberries thrive in Zones 4 to 9 in sun to partial shade and a range of soils. The red coastal elderberry (Sambucus callicarpa) blooms in spring before producing small red berries from summer through winter. This deciduous tree grows quickly to 20 feet tall and has light-green foliage that turns yellow to copper in fall. Red coastal elderberries grow well in full sun and sites with wet to moist, highly acidic to neutral soils. They are hardy in Zones 6 to 10. 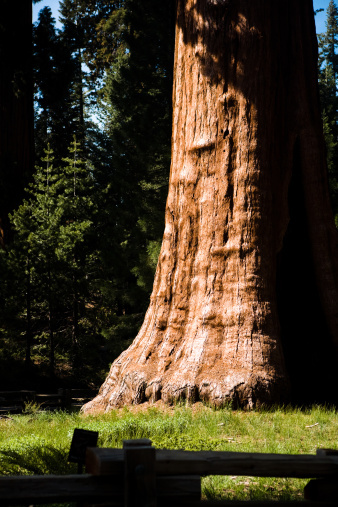 Non-native trees were introduced to North America after European settlement. The cleyera (Cleyera japonica) produces tiny, red, wildlife-attracting berries in late summer. This Japanese native grows as a small tree or large shrub that reaches 20 feet in height. It has glossy, dark leaves and blooms with aromatic, white flowers in fall. Cleyeras grow well in partial to full shade and moist, acidic to alkaline soils. They are hardy in Zone 8. The boxleaf azara (Azara microphylla) produces red berries in summer after it flowers with showy, fragrant yellow blossoms. This evergreen grows to 35 feet tall and has dark, lustrous foliage. Boxleaf azaras prefer partial to full shade and moist soil. They are hardy in Zone 8 and are native to South America. Unlike evergreens, which keep their foliage year-round, deciduous trees lose their foliage in the winter. The black mulberry (Morus nigra) is native to western Asia. This deciduous tree produces dark-red to black summer berries that attract birds. It is hardy in Zones 6 to 8 and grows in full sun to partial shade. Mulberries tolerate a variety of soils, including poor, rocky, dry, wet and alkaline. The Russian hawthorn (Crataegus ambigua) blooms in spring with short-lived clusters of white flowers, followed by dark-red berries in late summer. This deciduous tree grows from 15 to 20 feet tall and has dissected green leaves that turn yellow in fall. Russian hawthorns prefer full sun and well-drained soil. They tolerate drought, clay and compacted soils and are hardy to Zone 4. Are There Any Barberry Plants That Are Shade Loving? What Shrubs Can Be Planted on the West Side of a House? How Tall Do Evergreens Get?